Paint Spray Socks, Head Covering, Cotton Material, Color Cream, Size Universal, Painting And High Dust Environments, Package Quantity 10. Covers head to provide protection from overspray and other particulates. 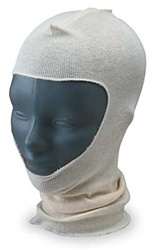 Comfortable sock fits over the head and can be worn with goggles, half-mask, or full-mask respirators. 1 size fits all. Breathable stretch knit cotton material.